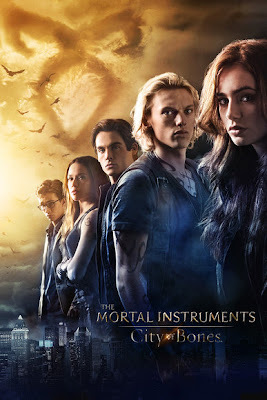 Summary: Set in contemporary New York City, a seemingly ordinary teenager, Clary Fray (Lily Collins), discovers she is the descendant of a line of Shadowhunters, a secret cadre of young half-angel warriors locked in an ancient battle to protect our world from demons. After the disappearance of her mother (Lena Headey), Clary must join forces with a group of Shadowhunters, who introduce her to a dangerous alternate New York called Downworld, filled with demons, warlocks, vampires, werewolves and other deadly creatures. Based on the worldwide best-selling book series. I took my husband who has never read Cassie Clare’s series with me on a date night to see City of Bones because I loved the original book in this series. The mythology, deep characters and magical setting drew me to Cassie Clare. However, about three minutes into the movie adaptation I could tell this probably was not for me. I don’t do well with violence and couldn’t stomach the gross alien like demons. The tone of the movie was too dark for my taste and I was disappointed there wasn’t more story line or back story. There were a few witty one liners that really showed Cassie’s sense of humor and the cat and mouse banter of her characters. I just found myself wishing there were more. It seemed to be a very fast paced jump from one Halloween like scene to the next. The focus rests almost entirely on Clary, Jace and Simon with supporting actors being given just a few lines in the entire movie. My husband was lost through most of it. After when I asked what he thought, he responded, “It was weird. They just jumped right in without explaining anything even up until the end.” He loved the action sequences and fighting skills of the actors, his favorite actor, Simon played by Robert Sheehan. However, he was scratching his head and leaning over to ask me questions through most of the film, which leads me to believe if you hadn’t read the book you might not get it. Lily Collins. Loved her. She fits Clary well and was beautiful, a great actress. I also liked the chemistry between her and Jamie Bower off screen in their interviews. The door of the Institute- very cool how it locked automatically on the inside. Hodge’s library and the portal. There was so much detail and attention to little things. The one liners that came directly out of the book. They made the mood light where it really needed to be. This movie felt too horror show, not based enough in reality for me. I wanted to see more of the Brooklyn, mundane real life New York of present day woven in to the fabric of the film, instead of mostly the alternate Shadow Hunter world. Simon. He fit the part exactly. How cool is it that he’s really from Ireland?! Robert is definitely not afraid to be himself. The greenhouse garden scene was magical, but the kiss…a little over the top. The first stand off with Luke and Valentine’s men in his shop. I found it very offensive. Valentine, Magnus or Alec. Valentine was not how I imagined him at all. Alec and Magnus looked the part but there was not enough character development or focus on their role to grow to like them in two hours. And, I’m sorry folks, I am still not buying Jaime as Jace. He is a good actor, very like able, genuine, but he’s too thin compared to what I imagined. I’ll admit he grew on me after seeing the movie, but I’m still not there yet. Consensus: I probably would not go to see it again and would not buy the movie. The wonderful ladies at Mundie Moms have excellent coverage on all things TMI if you would like to learn more. I spent my Waiting on Wednesday looking at angel photos on Flickr that reminded me of Patch and Norah, the Mortal Instruments series and Fallen by Lauren Kate. There are some breathtaking photos out there…Enjoy the angel gallery! Back in December we featured “Clockwork Angel” and the Infernal Devices by Cassandra Clare as our Waiting on Wednesday. Here are the pieces to start the Etsy store collection I am working on for the series. 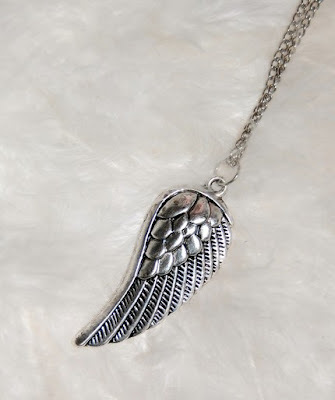 And if you love The Mortal Instruments, check out our Angel, Hush, Hush and Wings collections on the right sidebar store link for fairy and angel inspired jewelry, photography and journals! London, 1878: Sixteen-year-old Tessa Gray’s priority should be finding her brother, not falling in love, especially with two boys. She is soon caught in a dangerous love triangle where a wrong decision could prove fatal. Tessa will need all her strength to save her brother and stay alive as she learns the chilling truth of what really lurks on London’s streets after dark. How many books are there in The Infernal Devices trilogy? There are three. The title of the trilogy itself is The Infernal Devices: the first book is called The Clockwork Angel, the second The Clockwork Prince, the third, the Clockwork Princess. When will The Clockwork Angel be out? What’s The Infernal Devices about? The Infernal Devices is a series of prequels to The Mortal Instruments series, set in 19th century London. The story concerns 16-year-old orphan Tessa Gray, whose quiet life is thrown into turmoil when her older brother Nathaniel suddenly vanishes, leaving her alone. Her search for him leads her into Victorian-era London’s dangerous supernatural underworld, where warlocks throw masked balls for half-demon Downworlders. When Tessa discovers that she herself is a Downworlder, she must come to trust her natural enemies, the demon-killing Shadowhunters, if she ever wants to learn to control her powers and find her brother. Torn between the beautiful Will, a Shadowhunter who isn’t what he seems, and the devoted Jem, whose own deadly secret is slowly destroying him, Tessa must draw on all her strength to save her brother and keep herself alive in this deadly new world. Ahhhh… why oh why to we have to wait for this book and City of Fallen Angels? In the mean time here are some fan made trailers for Cassandra’s other books in print. 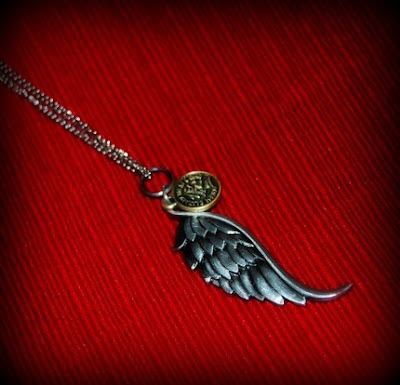 And enjoy some Jace inspired Fallen Archangel jewelry from my shop! If you are a Twilight lover you are sure to enjoy the Mortal Instruments Series by Cassandra Clare. This week the Mundie Moms site is giving away a free copy of Hush Hush, another awesome Young Adult Fiction book. 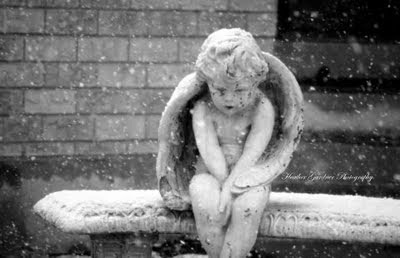 Their blog site featured Heather Gardner Photography/ Fire and Ice by asking us to use one of Heather’s angel photographs. Thanks so much to Katie B! We met her at Twi Con in Dallas and she is an incredible person. Check out her page and become a follower!